Wayne Rooney has confirmed his return to Everton, bidding farewell to Man Utd after 13 years at Old Trafford with both clubs doing a stellar job on social media. 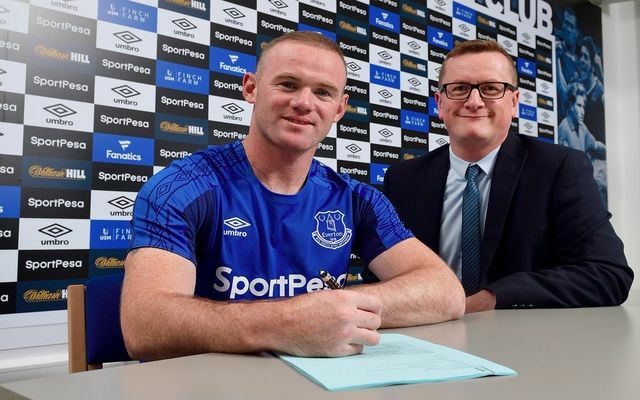 The Toffees have revealed that the 31-year-old has signed a two-year deal with them for an undisclosed fee, as per the official site, as they continued with their innovative way of unveiling new signings as seen in the video below. It’s an emotional return for the England international having left Everton in 2004, scoring 17 goals in 77 appearances for the club after making his debut for them at the age of just 16. Ronald Koeman evidently believes that the veteran can still offer a great deal, and with Romelu Lukaku moving in the opposite direction, he’ll hope that Rooney will be an influential figure for his side in the upcoming campaign and beyond. As for Man Utd, they paid a touching tribute to their hero who during his time at Old Trafford won five Premier League titles, the Champions League, the Europa League, the FA Cup and three League Cups among other things while also bagging 251 goals to put himself at the top of the all-time club record goalscorers list. He will undoubtedly be remembered as a legend by Man Utd supporters, but having seen a steady decline in his play over the last two years coupled with a lack of playing time, the decision to let him leave certainly makes plenty of sense.